A dog's kidneys remove excess nitrogen from its body and release it in urine. The excess nitrogen at the center of a pee spot causes yellow or brown spots, the symptoms of lawn burn. The nitrogen at the edges acts as a fertilizer, causing a urine spot to show lawn burn symptoms in the middle and green around the perimeter. Dogonit is a preventative treatment for urine burns that contains plant acids, enzymes and saponins. It is not a cure for grass that is already burned. Dogonit works by flushing the nitrogen salts from grass roots and stimulating root growth. It does this by loosening compacted soil; this lets in air, water and plant nutrients. Dogonit is sprayed on a urine spot then flushed with water. The manufacturer says that if the urine spot is treated quickly, nitrogen burn can be prevented. Dogonit treatment should be supplemented by an understanding of dogs, their diet, susceptible grasses and the practice of diluting urine spots with water to leach the excess nitrogen from the soil around the roots. Female dogs will urinate anywhere. They are more apt to empty their bladder completely; the result is a concentration of nitrogen in one spot. 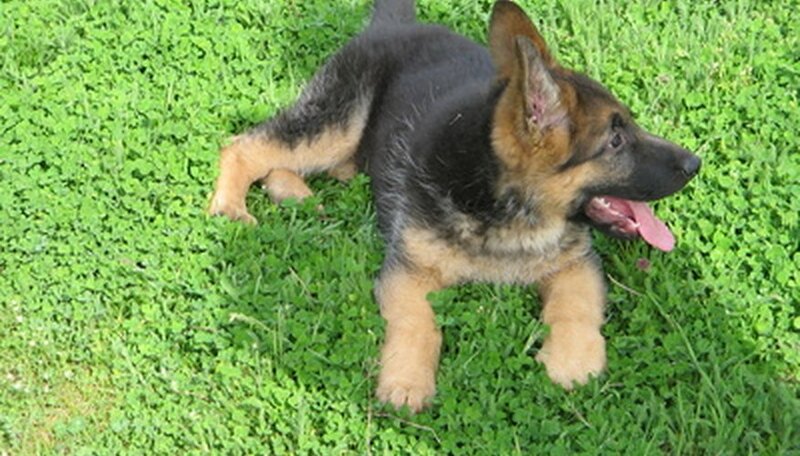 Male dogs learn to hike their legs when they are about 1 year old. They soon mark their territory with many small bursts of urine that grass can more easily handle. However, a bush or shrub that becomes a marking spot for a male dog may suffer nitrogen burns after repeated squirts. Small dogs cause less grass burn than large dogs because they eliminate a smaller volume of urine. High-protein dog foods add more nitrogen to a dog's diet. Unless a dog is an energetic hunting or working dog, it doesn't need the high amounts of protein found in many commercial dog foods. Canned dog foods generally have less protein and more water than dry dog foods. Adding water to dry dog food is one way to reduce the amount of protein in a dog's diet, thereby cutting down on the nitrogen in its urine. Agronomists at Texas A&M University report that tests show that fescue and perennial ryegrass are the most resistant to the effects of dog urine; Kentucky bluegrass and Bermuda grass are very sensitive to urine burn. Warm-season turfgrasses that spread by rhizomes and stolons will often repair mild lawn burns themselves. Lawns that are overfertilized or under stress by drought are more susceptible. A study conducted by Dr. A.W. Allard, a Colorado veterinarian, concluded that if a patch of urine is soaked within eight hours using three times its volume in water, the nitrogen in the spot will act as a fertilizer. After eight hours, the spot will begin to burn. If the watering is delayed for 12 hours or more, the lawn burn will get worse with the passing of time. Daily watering of grass early in the morning is not sufficient to dilute all urine burns.